For the steam cylinder oil winker to operate properly a check valve must be placed in the discharge line from the winker. 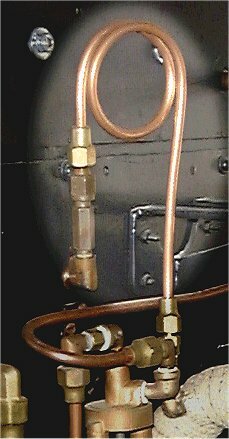 Do to the simplicity of non-condensing cars, many had the check valve attached to the discharge of the winker where the line to the steam line was short. When condensing cars were introduced with a conventional dashboard for mounting of gauges and controls instead of the simpler firewall mounting of the non-condensing car era, the installation of a steam cylinder oil check valve was more difficult do to space limitations. Thus the check valve was relocated to the boiler side of the firewall. Pictured at the left is the steam cylinder oil line coming through the firewall with a right angle tubing fitting. The hexagonal check valve is attached to this fitting in a vertical orientation. Out of the top of the check valve is the tubing connection to the steam loop (the steam cylinder oil tubing is partially hidden behind the low water cut-off fuel line). The steam cylinder oil check valve is similar in functionality and operation to the check valves found at other locations on a Stanley. Due to the thick molasses-like viscosity of the steam oil the motion of the check ball can be slow and thus a light spring is used to quicken the action of the check valve closing off. The steam cylinder oil check valve is slightly different form the more common check valves found on a Stanley in that a check ball is not used but is replaced with a brass rod with a pencil-like point on one end to seat in the body of the check valve. The valve can also be smaller since only minute amounts of steam cylinder must pass through the valve. Careful examination of the steam oil check valve shown in the photograph reveals it to be machined from two brass hexagonal pieces of brass which can be screwed together. The lower hexagonal section of the check valve has male 1/8" NPT threads and screws into the right-angle fitting coming through the firewall. Steam cylinder oil is supplied to the bottom of the check valve assembly. The check cylinder (the equivalent to the check ball in other Stanley check valves) is located inside a cylindrical cavity in the lower hexagonal section. A light spring is inserted behind the check cylinder and compression of the spring is accomplished when the hexagonal cap section is screwed in place. The oil flows through a hole in the hexagonal cap of the check valve which has 1/4" flare and flare nut for the attachment of the tubing that leads to the steam loop.